Nobody goes to a dirty restaurant. Period. End of story. All it usually takes for someone to shun your eatery is for one of their friends to tell them of an unclean story that happened to them while in your establishment. Just one story of the unclean state of your facilities, or an uninvited six-legged guest at their table could potentially lose you that person’s entire group of friends, especially with the advent of today’s digital communication. There could be a picture of an insect and a geo-targeted location of your restaurant on Facebook, Twitter, or Instagram before that guest even leaves your place of business. Or you could skip every one of these unsatisfactory outcomes and hire a professional restaurant cleaning crew to manage the sanitation of your establishment. 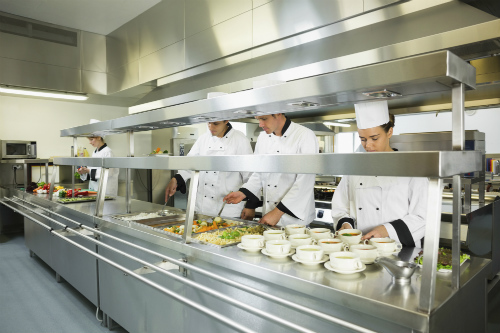 With a highly trained and skilled crew of restaurant cleaning technicians your restaurant’s patrons will enjoy the full extent of your bistro’s hospitality. You, as a restaurant owner or manager, will only have to focus on the restaurant’s food, staff, and customers. At the end of the night when your employees are tallying their tips and you are shutting down the equipment, your restaurant cleaning team will sanitize and disinfect according to how you want your establishment cleaned. A professional crew from Jani-King will create a customized cleaning schedule based on the time constraints you have, as well as the necessary actions you need performed. The perks of having a restaurant cleaning crew that has customized instructions from you personally will show the dividends immediately. Your staff will appreciate working in a clean environment and your customer base will start to swell as patrons tell their friends and family about the greatness of the atmosphere (not to mention the food) of your restaurant! Give your local Jani-King a call today and ask them about setting up a consultation in your establishment.